Imagine living in a fairy tale. Where the houses are like pictures on a chocolate box, painted in shades of pastel and decorated with fairy lights that twinkle and glow in the night. Imagine a brightly coloured playground outside your door, with slides and accessible swings where your children can play together, even if one of them travels on wheels. Imagine a place where you can ride horses before you feast on a breakfast of ice-cream and pancakes, a place where a cookie-cart stops right outside your door with an endless supply of doughnuts and coffee, a place where you can meet pirates and princesses, gingerbread men and fairies. Imagine being in a place where disability and illness and test results and fears for the future couldn’t touch you; a place where magic happens and dreams really do come true. For one week in December, we were there. I applied to Caudwell Children’s Destination Dream’s programme over a year ago, never daring to believe that we’d be offered a place. Once successful I was too afraid it might never happen to get excited about it; Hugh’s complex medical needs are such that he can end up in hospital at a moment’s notice. We didn’t even tell our eldest son Sean that we were going to Florida until we were nearly at Gatwick! Had I even tried to imagine what it might be like, I could never have dreamt of a holiday as magical as this. 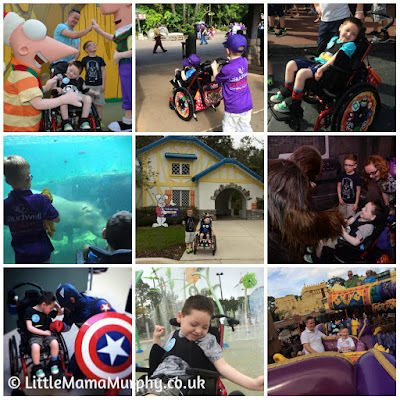 The Give Kids The World Village in Orlando, is a village specifically for children with life threatening conditions and their families – their motto ‘Where Happiness Inspires Hope’ sums up the experience perfectly. From the smiling, friendly staff and volunteers for whom nothing was too much trouble, to the daily visits from children’s TV characters, from the outdoor pool and splash area, to the accessible train and fairground rides, from the lively kid’s parties with fancy dress and sweets to the visit from Santa, everything was designed to create fun filled and happy memories. And there were endless, endless photo opportunities. It’s hard to find the words to describe and do justice to the whole experience, so instead here’s some photos of the special things we enjoyed. Seeing Hugh's face light up as the African drum beats began and he recognised the haunting music of the Lion King brought tears to my eyes. Watching the two boys laugh with glee as they enjoyed their first fairground rides together was priceless. Seeing the awe in Sean's eyes as he met Chewbacca and listening to the giggles from Hugh every time Darth Vader spoke to him still makes me smile. We must have walked miles and miles every day making our way around the five theme parks trying to squeeze in as much from every day as we possibly could. We met Indiana Jones' stunt double and went on a mini-safari. We took a boat through Jurassic Park, boarded The Hogwarts Express from Platform 9 3/4 and took a magical carpet ride. We fed sharks, stroked dolphins and watched hippos swimming underwater. One of the many highlights for me was meeting the Marvel characters. Captain America in particular spent a lot of time with Hugh and made him feel very special. In fact at all of the parks we were whole-heartedly welcomed and treated like royalty. Alongside all the joy and happiness was a wonderful sense of camaraderie amongst the 25 families. Each fighting battles at home, some obvious, some less so, but all determined to make magical memories as a family. The children bonded immediately, in that way that children find so easy, and within minutes of meeting there was a gang of boys and girls chasing and playing and laughing, (almost) without a care in a world. The amazing trip would not have been possible without the immeasurable amount of planning and organisation from the Caudwell staff. They went above and beyond to ensure all our needs were met and we were properly supported. The team of volunteers were a godsend, from helping us get checked in at the airport, directing us around the parks, taking photos, helping push wheelchairs and even accompanying us on rides - an extra pair of hands when we needed it. And the medics? Well thankfully we never needed them, but this trip would not have been possible for us without them. Having such highly trained staff on call 24/7 was the safety net and reassurance we needed to enable us to travel with Hugh. The week was packed with so much fun and laughter, but there were tears as well - tears of happiness, tears of joy but sometimes tears of sadness too. The Star Fairy lives in the Castle of Miracles in The Give Kids the World Village. Each 'Wish Child' is given a star on which to write their name; the Star Fairy collects it and sends it to the Castle Sky. It is a humbling sight to see Hugh's star nestled amongst the hundreds of thousands of stars dedicated to the Wish Children who have gone before him; waiting to be joined by the many more Wish Children that will follow after. It will have a home there forever. Poignant too, were the magical pillows the boys made together. The pillows are filled with 'a brother's love' and they have each slept with their pillows every night since. Standing under the glittering lights of the huge Christmas tree at The Give Kids the World Village, listening to the choir sing "Silent Night", a lump grew in my throat; as magical as the holiday was, there wasn't one family there that wouldn't give it all up to have their children healthy, to have a future guaranteed. And as the week drew to a close, the safe little bubble where reality couldn't touch us began to draw in, and our thoughts and those of some of the families' around us turned once again to hospital letters, scans, appointments and treatment. Yet this holiday enabled us all to make memories that we would never ordinarily be able to make. Memories we will treasure in our hearts and minds;memories that will help us through the difficult times ahead, memories we will hold on to forever. Memories are so incredibly important and last a lifetime. The stars will shine brightly whatever the future brings. As ever, beautifully written and heartfelt. 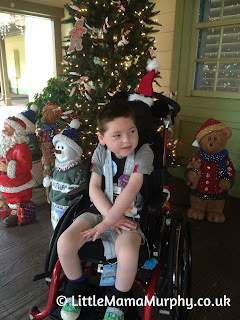 Thank you for sharing your family's holiday and prove that wishes really can come true. Thanks Claire, we do have so many precious memories following this trip. The tears started for me at the first line. Trying not to sob in-front of my husband! Disney World/Florida is my happy place, we got married there. I'm dreaming of a day we can go back but things keep pushing it out of our reach. I'm so glad your boys got to experience it, and you. What an amazing charity. It looks likes and sounds like you had an amazing time. Thanks for linking up with Small Steps Amazing Achievements, sorry for my late comment we had a terrible day/night with teething.